This is a great blend of heirloom varieties with glossy, crinkly leaves that are thick and tender. The flavor is full and slightly salty with the typical bitter bite of this type of cooking greens, similar to spinach. A rainbow blend of varieties with vibrant leaf and stem colors have been combined in this packet. Chard is an easy-to-grow, attractive plant that also grows well in containers and garden borders. 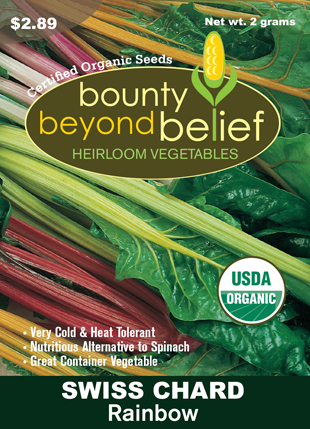 Swiss Chard is a great companion plant for beans, onions, tomatoes and cabbage. Do not grow your chard next to melon, corn or herbs.